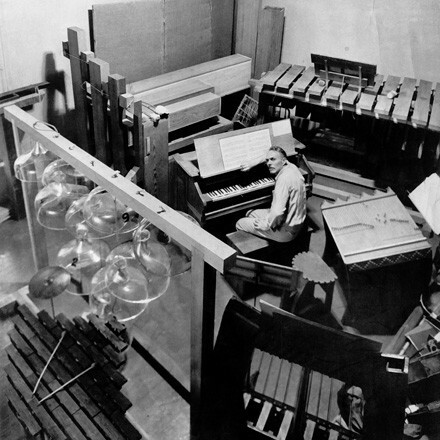 One of the reasons the brilliant music of American composer Harry Partch isn't more widely known and performed has to do with the fact that he had to custom-build an orchestra of instruments to play the sounds of his 43-tone scale. Those instruments, such as diamond marimba or cloud chamber bowls, were fragile and imperfect to begin with, and for many years they were stored at Montclair State College in New Jersey—they recently moved to a new home in Seattle at the University of Washington. Because of their fragility and preciousness, musicians who wanted to play Partch's wonderfully idiosyncratic music have been forced to build their own versions of those instruments. No one has matched the perfection and beauty of the set of instruments the superb Berlin ensemble MusikFabrik has been using in their astonishing revival of the Partch masterpiece Delusion of the Fury, which I count myself lucky enough to have seen at the Ultima Festival in Oslo in 2012. But a Los Angeles ensemble named Partch has been playing the composer's music since it formed in 1981, though with less fanfare. In 2008 the group performed Partch's three "dance theater" works called Plectra and Percussion Dances in their entirety for the first time. The original 1953 recording by Partch's own ensemble Gate 5 was missing a few movements and lacked the tenor saxophone parts that were written into a few pieces. Last fall Partch (the group) released their dazzling version, the second volume in a three-release series of Partch (the composer) music for Bridge Records. To this day the music still sounds like nothing else (although if you're a fan of Tom Waits you'll notice how much he borrowed from Partch on records like Swordfishtrombone and Rain Dogs). Today's 12 O'Clock Track is the opening movement of Ring Around the Moon: a Dance Fantasm for Here and Now.